Motorboats: Mboma has two 9-seater motorboats for hire. The boats have padded bench seats, shade roofs for the sun and are hired out with drivers and fuel included. The drivers are all professional guides. Mokoro: Eight mokoro are available, each seating two passengers. The polers are all professional guides who know the lagoons and channels of the delta. All mokoro are made from fiberglass as part of a conservation effort to preserve the trees. Motorboats: These can be hired per hour or per day, depending on your program. An ideal way to visit the Godikwe Heronry, seasonal breeding site of thousands of herons and other water birds. Or just cruise the beautiful channels and lagoons. Fully catered island overnights: On pristine islands in the heart of the Moremi - let us do all the work. Simply climb on the boat and be taken to your mobile camp with beds, mattresses and linen. Fully catered. Bucket showers and field toilets. The boat and guide stay with you at all times. Self catered island overnights: On the same pristine islands in the heart of the Moremi - Use our boats and bring all your own equipment, food and bedding. The boat and guide stay with you at all times. Mokoro: Mokoro can be hired on an hourly basis for relaxing trips on the pristine lagoons around Mboma island. This experience of untouched nature is an essential part of any delta visit. Directions: Establishment are signposted from the South Gate entrance and from Third bridge campsites in Moremi. 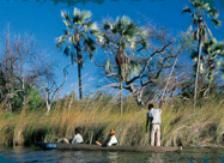 Mboma is situated on the western edge of the dry land mophani tongue, close to Godikwe lagoon. Explore an exclusive part of the Okavango Delta inside the Moremi Game Reserve. This world heritage area with its abundance of bird life and waterways will bring you in close contact with this fascinating ecosystem. Enjoy the open floodplains of the Delta in the traditional way with mokoro. This quiet way of moving in shallow water ensures an undisturbed interaction with the sensitiveness of the Delta. An adventure of the secret waterways by motorboat will take you through the mysteries of the deeper channels and large lagoons where several birds breed and elephants graze on islands. Experience the wildlife of the Delta by visiting various islands various activities. If you plan a trip to the Moremi Game Reserve you should not let the chance go by to overnight on one of the islands. There are three islands to overnight on; namely Gcodikwe 1, Gcodikwe 2, and Xhobega. These islands are in the area of the Gcodikwe and Xhobega Madiba (Lagoons). The islands are situated in a World Heritage site with some famous heronries in the area. An overnight on an island is filled with night sounds of the nightlife of the Delta and the early morning rich in bird sounds - a real adventure of a lifetime. We supply you with a motorboat, 3 x 3m dome tents, mobile dinning room, proper fold out bed, linen, a chef (makes outstanding dishes, and a really good host) and guide for the night. You can also stay on a Self catered basis were we book the Islands for you but you take your own equipment and food. In this case you take your equipment with you on the boat and the boat driver first take you to the Island so you can set up your camp. If there is a lot of equipment it can be taken first while your guests are enjoying a 2 hour mokoro trip. 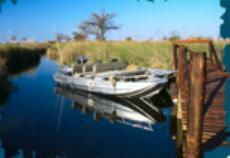 The Mboma Boat Station is on the most North Western end of the Moremi Game Reserve to be reached by vehicle. It is about 15km away from Third bridge campsite and about 63km from South Gate. It will take you approximately 3 hours from South Gate and 1 hour from Third Bridge to reach. Boat hire/hour per boat (max 9 pax): Hours must be specified. Island overnight: self-drive, self-catered, per boat (max 9 pax per boat). Includes boat, driver/guide and fuel. Excludes equipment, food, park fees and camping. Boat back at boat station by 08:00 next morning. Limited cash bar. DWNP permits excluded. Island overnight: self-drive, fully catered. Includes boat, fuel, driver/guide, equipment, food, camping fees. Excludes park fees. Limited cash bar. Island overnight: fully inclusive. 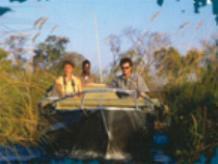 Includes boat, fuel, driver/guide, equipment, food, camping, park fees, transfers Mankwe � Mboma - Mankwe. Limited cash bar.